My one and only Kramer rises from the case. Welcome indeed. That's a rare color for a sustainer. You don't see those everyday. I like it. Welcome to the Kramer Forums! Way to kick in the door and announce your arrival! My sentiments exactly. Kee-uk Assss! Del Hudson wrote: Welcome indeed. That's a rare color for a sustainer. You don't see those everyday. I like it. Thanks man...I believe its called Champagne. It actually changes color depending on which angle you look at it. Fret-Shredder wrote: ...I believe its called Champagne. AFAIK did the earlier Sustainer not have the separate compartment for the batteries but had them crammed in the electronic compartment which could cause damage to the board. On them the light was red and not when the unit was engaged but only when the battery was dying. But there are peeps here who'll chime in with the correct infos . That with plugging in the cable is normal for anything battery-powered, be it sustainer, or booster or whatever. The battery on switch is in the barrel jack and gets turned on when you plug in the cable. Nice guitar and I really like the color. Just from my limited knowledge I have tried to obtain about my Sustainer. I own an early one. Early ones were very basic in appearance and have no binding on the neck. Only binding on the head stock. Dot inlays on the fret board, Kramer name on 12th fret. They had no battery compartment. The 2 batteries were located in the electronics cavity. They had one red LED light to indicate when the battery was low. I think the early ones all will work if they are turned on without being plugged in, resulting in a dead battery in a day. Maybe they changed this? I remember when they were new, music stores would demo them that way. Early color options were Black, Red, Blue, and White. Later the claws would show up as an option on fret boards. Binding would be on the side of the fret board. Then the battery routing behind the tremolo cavity, along with the green LED indicator (on) light. More color options. There are 2 types of circuit boards. Early and Late. The blue prints are on vintagekramer. 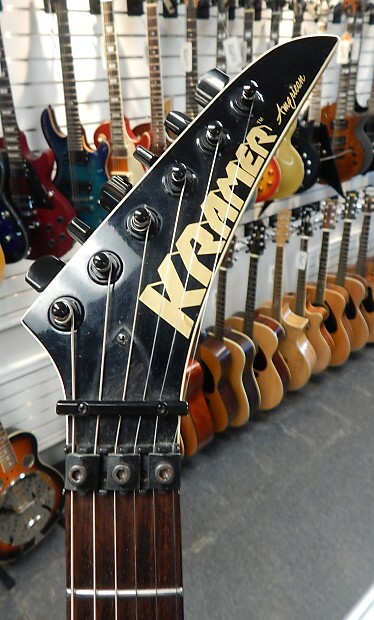 As usual you cant rely on Kramer serial numbers to date a time frame. These pic's are from when I first bought it. 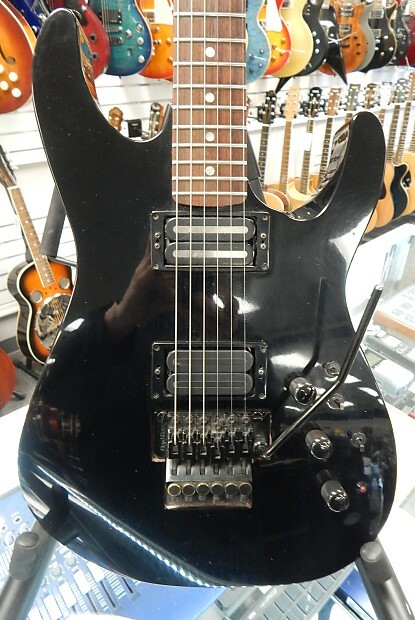 This guitar sounds AWESOME with a Duncan 78 custom trembucker now in it. I can confirm that my model utilizes the LED when the batteries are low which should indicate early circuitry. I purposely drained both 9 volts down to about 6 volts each and the LED now lights up when I turn ON the sustainer. My body has the separate battery compartment which should make it a later model too. Strange.